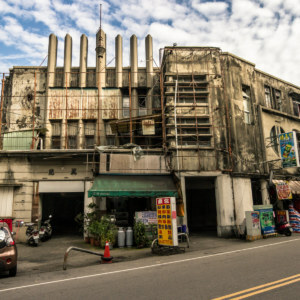 Wǔzhōu Theater 五洲戲院 is the last remnant of cinema in Chíshàng 池上, Taitung 台東, a picturesque town located in the fertile East Rift Valley 花東縱谷 (中文) of Taiwan. 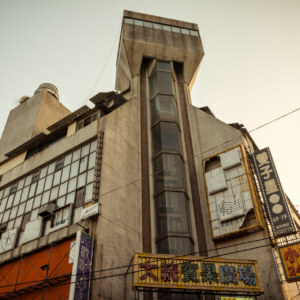 Built in 1965 in the midst of the Taiwan Economic Miracle, it remained in business until 1982. 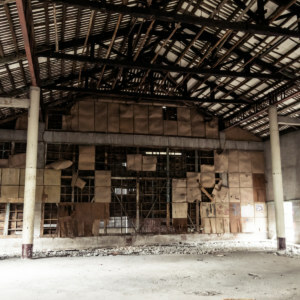 After the final screening the theater was neglected for decades, falling into disrepair but remaining more or less intact until recently. 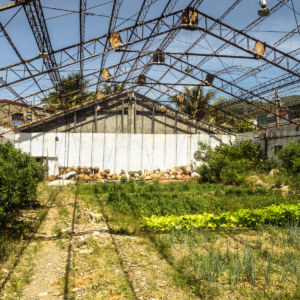 More recently Chishang emerged as a tourist destination, spurning a local community development association to invest in revitalizing the theater in 2013. 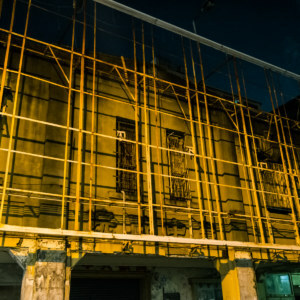 Chishang’s sole remaining movie theater at dusk. A message beneath the ticket booth. Despite the vintage style this was recently installed. 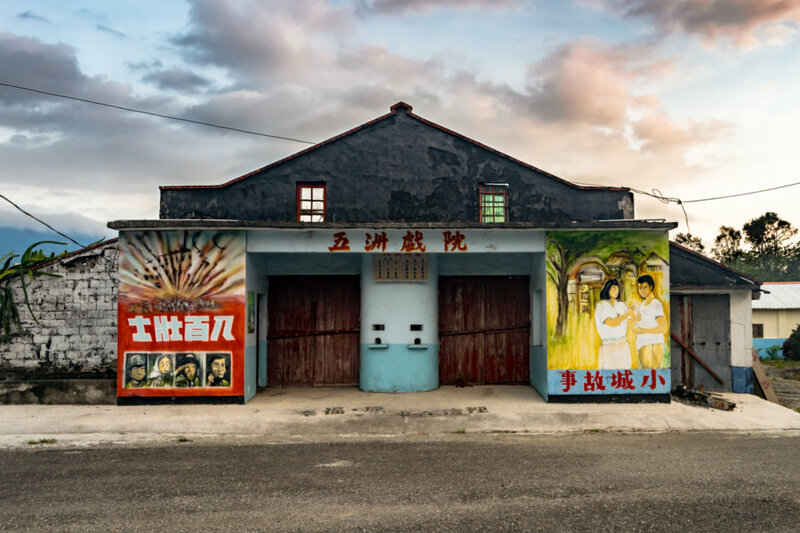 The first thing you’ll notice about this old theater are the murals painted by local artist Wèi Qīzhāng 魏期章 during the 2013 revitalization project. On the left you’ll see a poster for Eight Hundred Heroes 八百壯士 (中文), a patriotic war epic released in 1977. On the right is The Story of a Small Town 小城故事 中文, which also featured theme songs by Teresa Teng 鄧麗君, one of the most famous Taiwanese vocalists of her time. Above the entrance is a fare table displaying insanely cheap ticket prices (including a discount for military veterans), obviously a replica of recent manufacture. 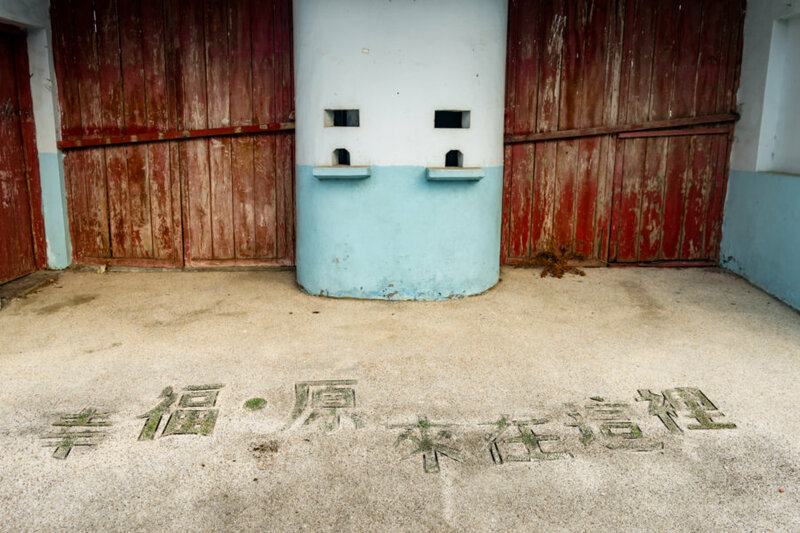 Below the ticket booth you’ll notice a phrase embedded in the ground: 幸福原來在這裡, something along the lines of “as it turns out, happiness is here”. 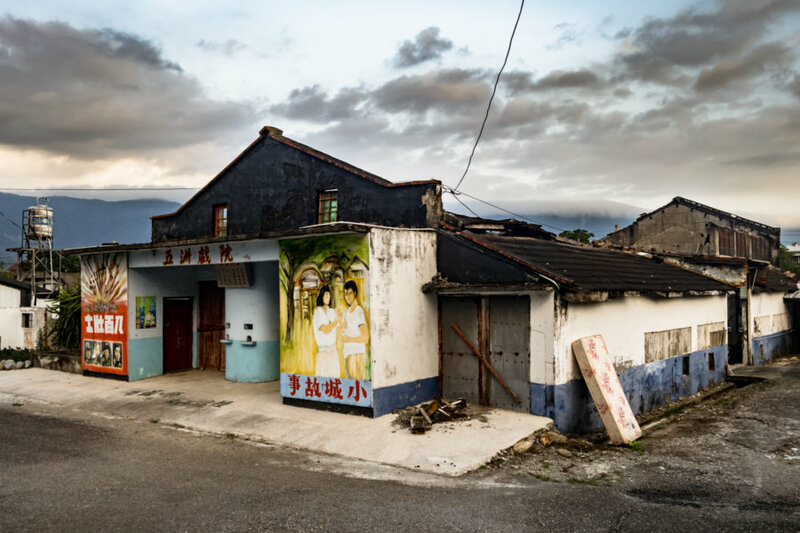 This is a play on words, for the theater is located within Fúyuán Village 福原村. The exterior appears to be in decent shape but the inside is another story. 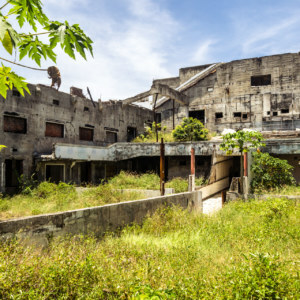 News reports indicate the theater was still intact in 2013—but the rooftop completely collapsed sometime since then, fully exposing the interior to nature’s wrath. 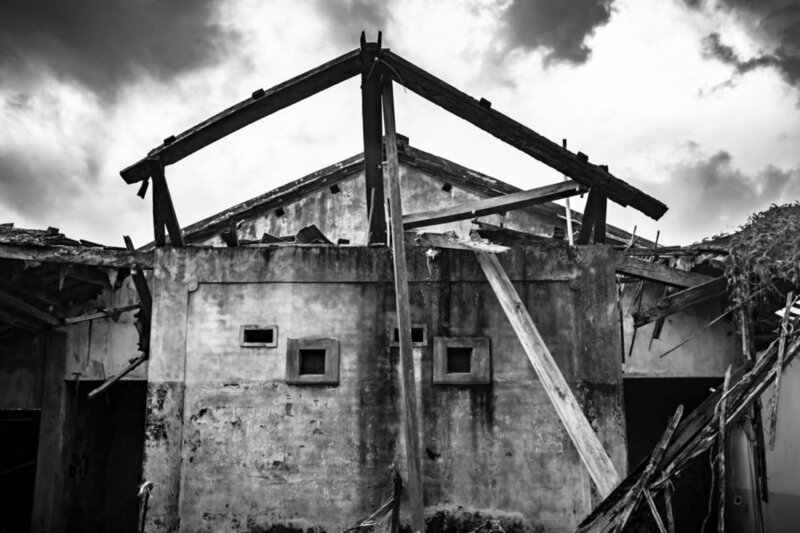 Eastern Taiwan is regularly struck by typhoons—and Nepartak made landfall just south of Chishang in 2016—but I have no idea whether the theater collapsed in a dramatic storm or more mundane circumstances. 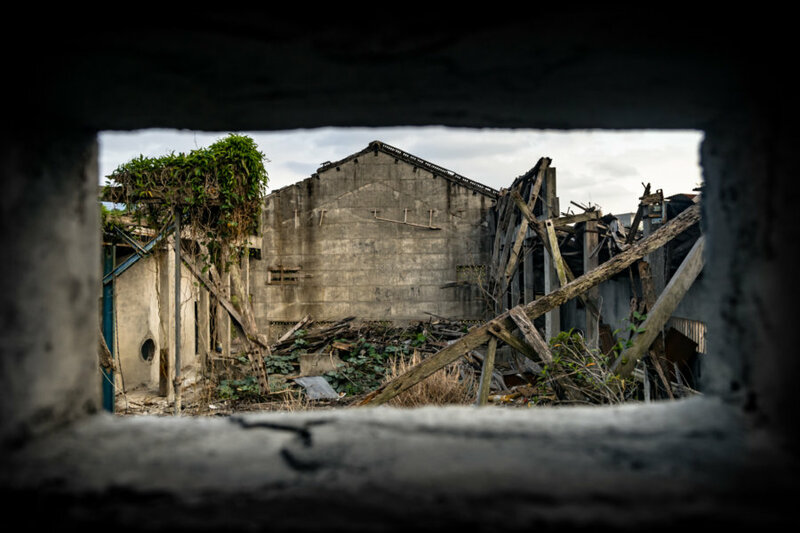 Whatever the cause, decay has been swift since the theater broke open, and what remains of the interior is a total disaster zone. It is hard to imagine that this theater once accommodated 400 patrons—with standing room for 50 more. 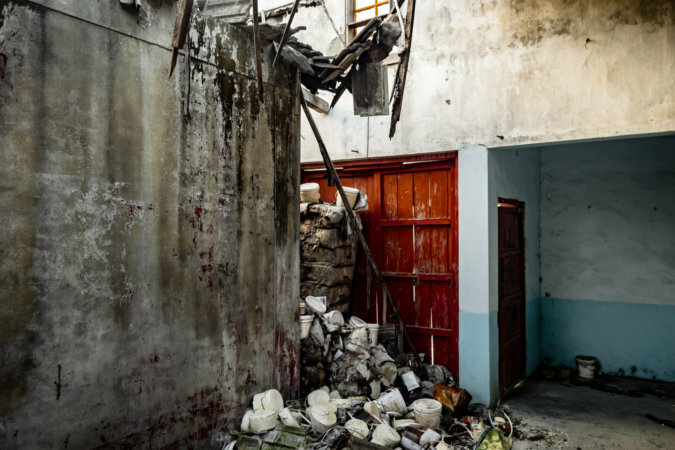 Inside the remains of Wuzhou Theater. 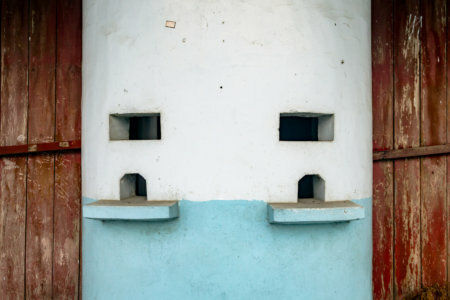 The far wall was once a movie screen. 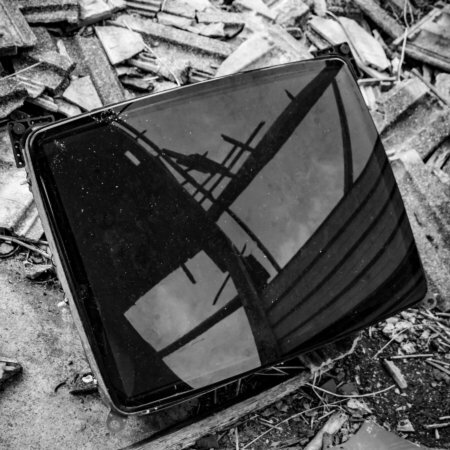 A scene of abject desolation and decay. The detached retina of the mind’s eye. 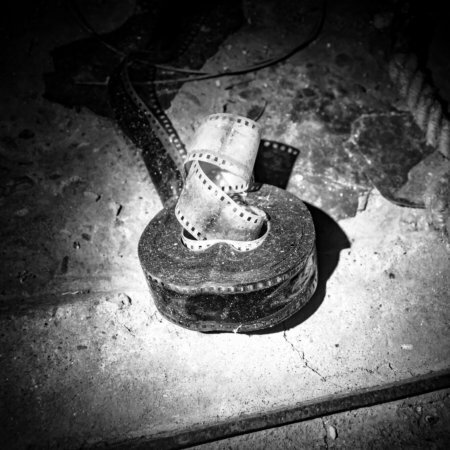 A coil of film on the projection room floor. Facing the projection room in the gathering gloom. Small town theaters often provide insight into local population dynamics, economic development, and urban planning history. 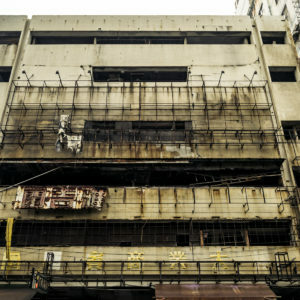 Wuzhou Theater was one of three cinemas in town1, and probably the last to be built. 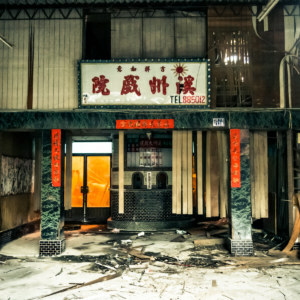 It flourished throughout Chishang’s most prosperous years and went out of business not long after the town slipped into decline. The early 1960s were a time of explosive growth and great promise, with ample employment opportunities in agriculture, forestry, and an important veterans affairs facility. 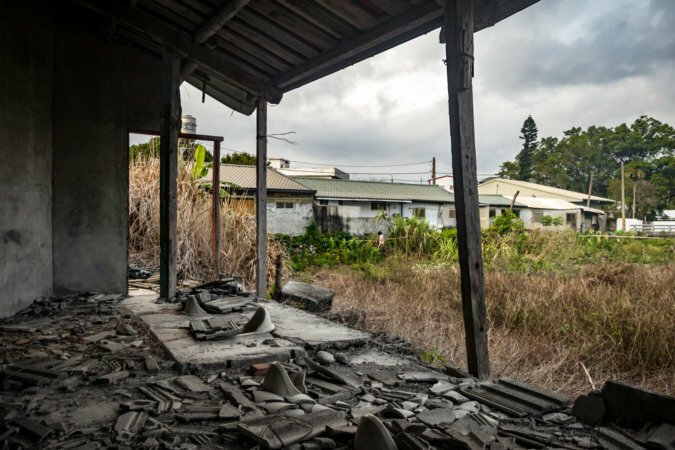 Chishang reached a peak population of approximately 15,000 sometime in the 1970s but has been emptying out ever since—most recently dropping below 9,0002. 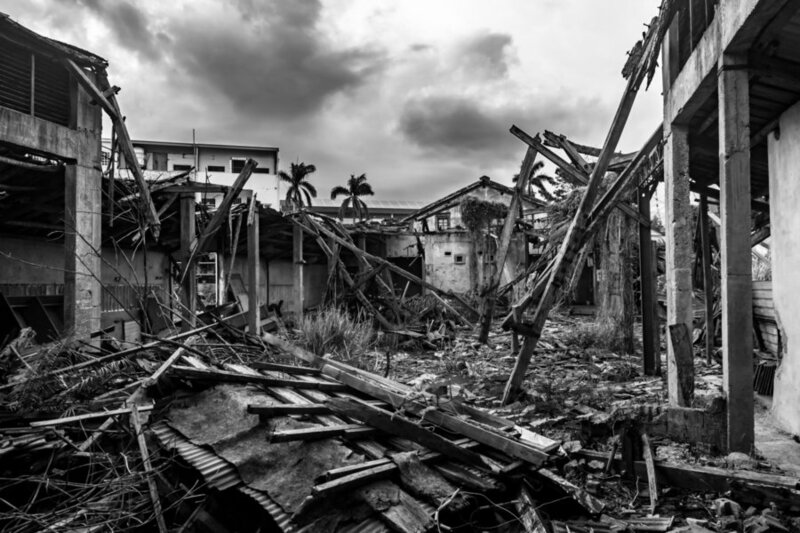 This exodus is partly due to nationwide trends of urbanization and rural flight but also attributable to the collapse of the sugar and lumber industries, both of which contracted in the 1980s and effectively ceased to exist in the new millennium3. 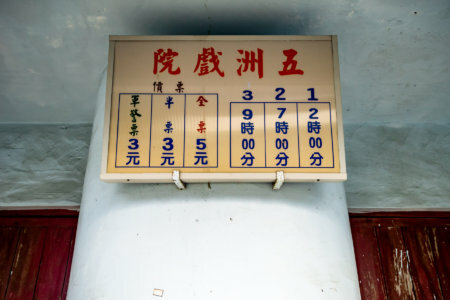 Nowadays Chishang is mostly known for tourism, bento boxes4, and its agricultural output—especially rice, for which it is famous, as well as peanuts and corn. The view from the projection room of Wuzhou Theater. Projection room and main entrance, a tight squeeze. Fresh air flowing through the old restrooms. An open air theater in Chishang. Several other details can be gleaned from this excellent interview with the owner from 2011. 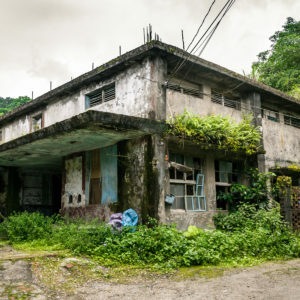 Taitung County was once home to 36 movie theaters5 but it was quite some time before newly released films arrived in this remote part of the island—years in some cases! 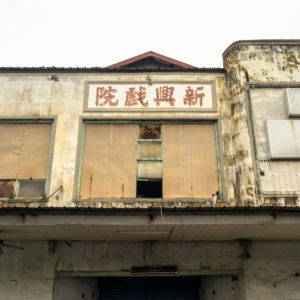 After films were shown in Taipei they would be shipped down to Taitung by rail and shared between different theaters, sometimes with same-day showings. 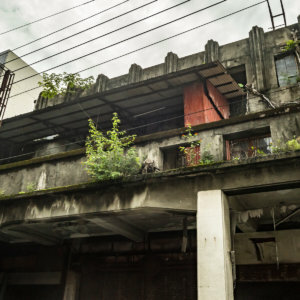 The owner mentions a close relationship with the long-vanished Dōngshān Theater 東山戲院 in neighbouring Guānshān 關山 and introduces the practice of pǎopiàn 跑片, just-in-time delivery of film canisters by bicycle or motorbike. 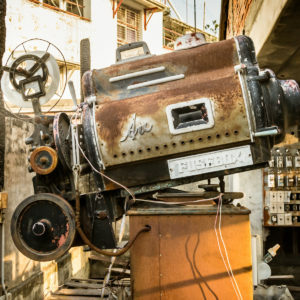 Back in those days films were contained on multiple reels—and through a continuous relay system the same film could be shown on multiple screens simultaneously, albeit with staggered showtimes. 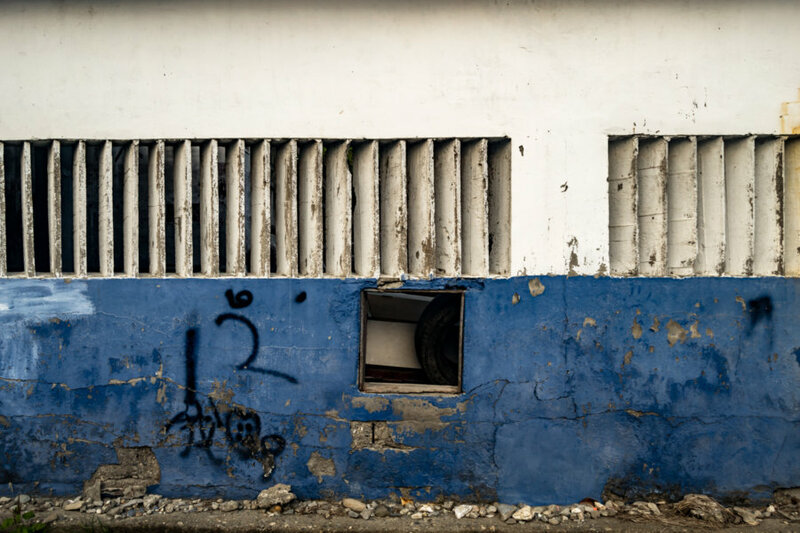 Ventilation along the side of Wuzhou Theater angled to ensure the silver screen is only visible to paying customers. 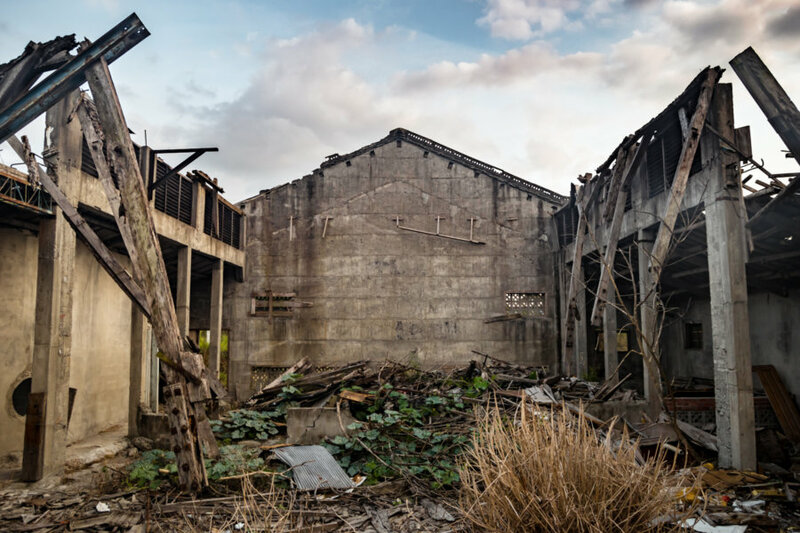 One last look at the ruins of Wuzhou Theater beneath dusky skies. Wuzhou Theater occupies an open plot of land next to the railway line on the back side of the station. This somewhat obscure location—away from the main commercial thoroughfare—helps to explain why it remained derelict for so many years while other theaters in town were demolished. 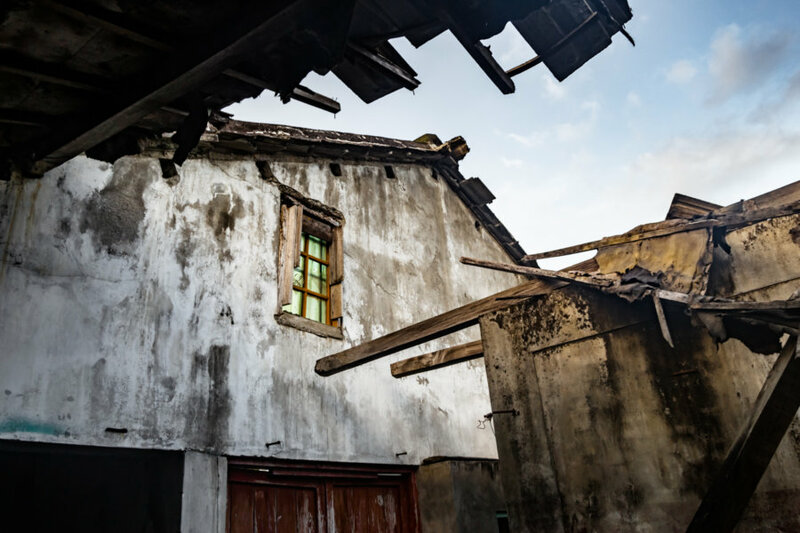 Now that Chishang is experiencing a second life as a popular tourist destination the theater has become an asset to the local community and finding it isn’t difficult—just enter the Chinese name into Google Maps and it will appear. You’re welcome to wander over and take a look but be mindful of what dangers await should you explore the interior.